Noch ein Layout mit einem Foto vom Tacheles, in Berlin. 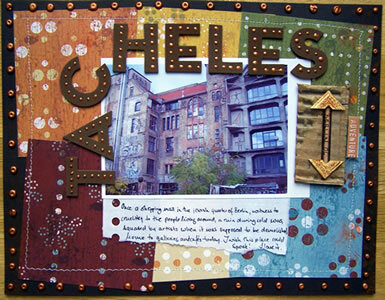 Another Layout with a photo of Tacheles in Berlin. Journaling: Once a shopping mall in the jewish quarter of Berlin, witness to the cruelty to the people living around, a ruin during cold war, squated by artists when it was supposed to be demolished, home to galleries and cafÃƒÆ’Ã‚Â¨s today. I wish this place could speak! I love it. Und noch so ein tolles Layout!